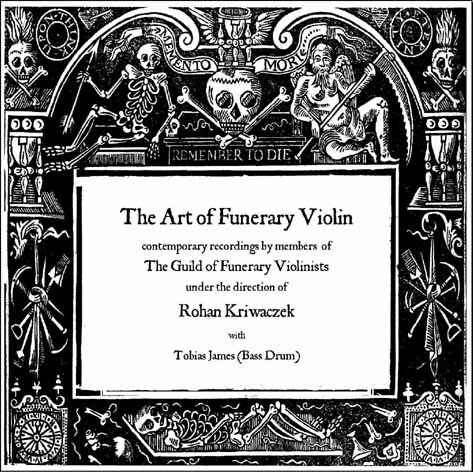 Funerary Violin Music CDs by Rohan Kriwaczek. "The Art of Funerary Violin" presents a selection of works from the great masters of Funerary Violin dating all the way back to George Babcotte's monumental Dirge, performed in 1586 for the funeral of Sir Philip Sydney. 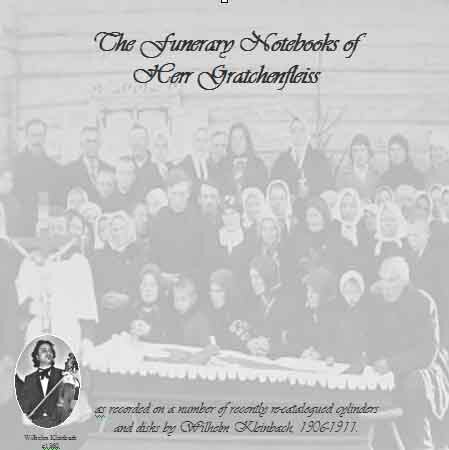 It includes works by Addleston, Meunier, Gratchenfleiss, Sudbury, Duibuisson and Eaton, covering the entire period when the Art was at the very centre of funerary ritual. 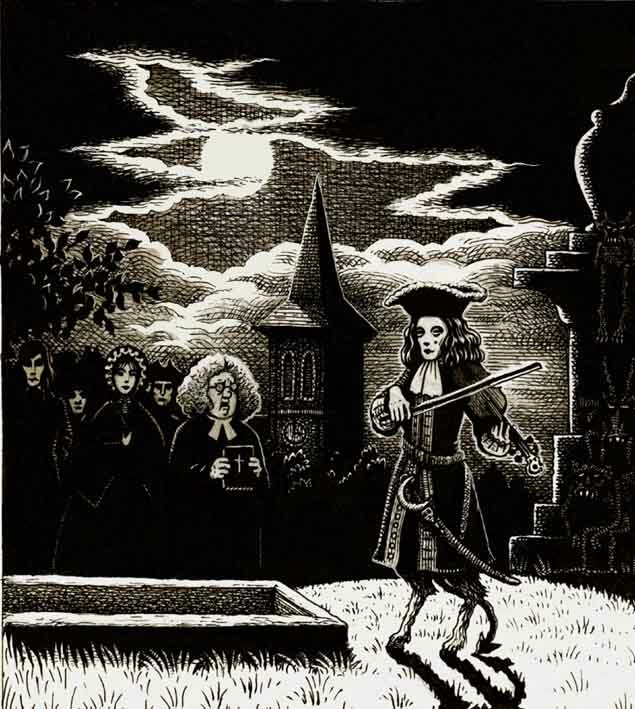 The music is performed by members of the Guild of Funerary Violinists, under the direction of Rohan Kriwaczek, and is occassionally accompanied by Tobias James on bass drum. 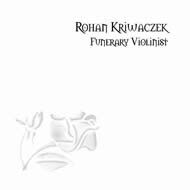 "Rohan Kriwaczek - Funerary Violinist" offers a tasteful selection of solo violin music that might be deemed appropriate for funerary performance. Ranging from simple folk tunes, to classical works and, of course, works from the Funerary Violin repertoire, this CD clearly demonstrates the musical and spiritual advantages offered by the choice of a Funerary Violinist. 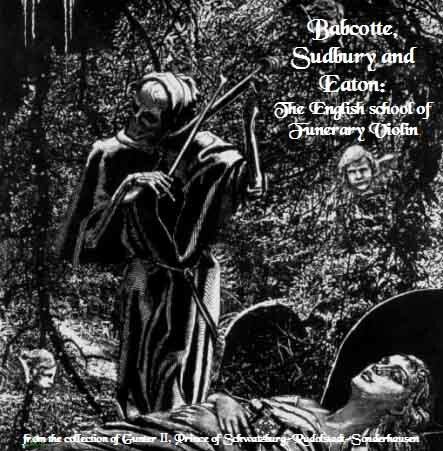 Babcotte, Sudbury and Eaton: The English school of Funerary Violin - from the collection of Gunter II, Prince of Schwatzburg-Rudolstadt-Sonderhausen. 3. Introduction and March - To show the Soul’s newfound delight, and expel the sadness of those who mourn. 4. Dream - As the Soul looks down upon all that is laid aside, a brief moment of grief before the bargaining begins. 5. Panic - For the banishment of all spirits whose heart is not of purest white, and to drive away the evil- minded ghosts that dwell where death is to be found. 6. Flight - As if to dispel all doubts, the cleansed Spirit marks a final path between God and Man, before its ultimate ascension. 7. Eulogy - A final farewell as the Spirit rises unto God; not without sadness we put our faith, and the spirit of our dead, in God’s own hands. (hear a sample from a modern recording). 8. March - Now that all is done and as it should be, we may weep without reserve. The Funerary Notebooks of Herr Gratchenfleiss - as recorded on a number of recently re-catalogued cylinders and disks by Wilhelm Kleinbach, 1906-1911. 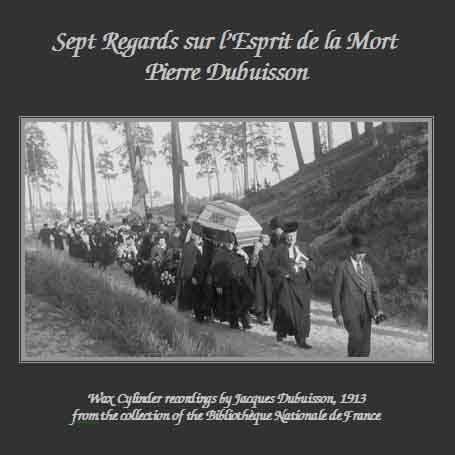 Pierre Dubuisson - Sept Regards sur l’Esprit de la Mort - Wax Cylinder recordings by Jacques Dubuisson, 1913, from the collection of the Bibliothèque Nationale de France. 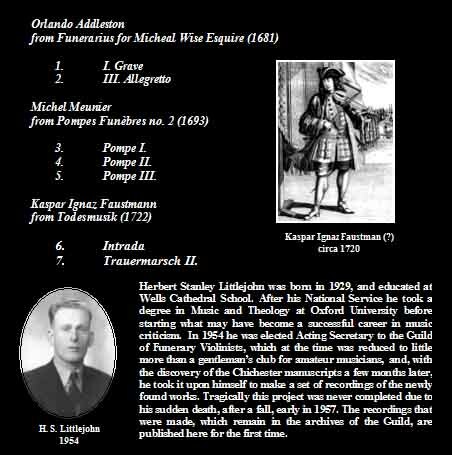 17th and 18th century works of Funerary Violin - as copied by Fr. John Brockley in 1726 and preserved in the library of Chichester Cathedral - performed by Herbert Stanley Littlejohn 1956.